This is already the 12th day of the housemates inside the PBB house and things are becoming tougher. This time, the attention of Chevin and Cess was taken by Big Brother informing them that a total of 2,201 selfies were taken by the housemates for the past day. 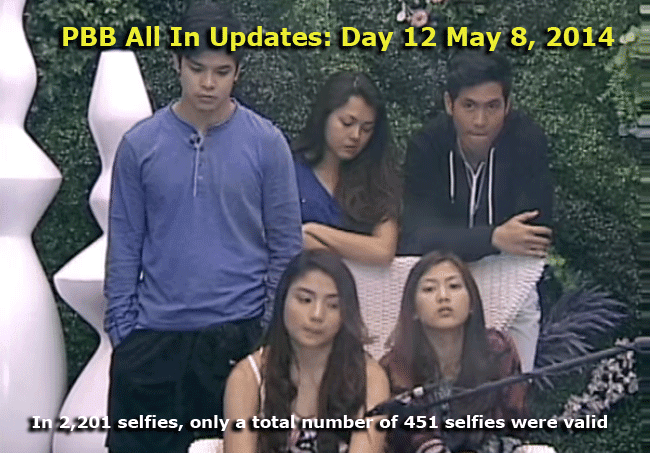 Of the 2,201 selfies, only a total number of 451 selfies were valid and that brought a new twist on their weekly task. Changes were made and that includes the removal of the roulette because the housemates will be included in the daily selfie. This time, a colored ball from a box is an indication of where the housemates will stand and take a selfie. This will serve as their platform. The color choices are blue, yellow and red and they differ in terms of size. They are present in the living room and looking at the platforms, the smallest of them is the red. This day alone, Big Brother made an announcement of the rate of selfies that they have taken for the last five days and the result was 6,670 selfies were taken and of that number, 3,527 were valid. This is an indication of the success in their weekly task. We have known from the past that there were failures in the weekly tasks of the housemates and this time, it was a success. 12 days have already passed and the housemates are still clinging to what could happen in the days to come. Well, let us know. Keep watching PBB and be updated.